First, I should start with those at the bottom of the heap. On the run to Cebu on business, I tried an ensaimada from Red Ribbon at the departure lounge of the PAL terminal in Manila. Disgusting. End of story. I took a photograph of it and canâ€™t even find it in my filesâ€¦ it decided to vanish on its own out of embarrassment and the possibility of going head to head with the competition. It was pricey too if I recall right, but then again, it was the departure lounge. Final verdict: WASTE OF CALORIC INTAKE and AVOID. Next, I sampled the ensaimada at Sugarhouse Rockwell. I was disappointed. The ensaimada I tasted was dry, the grated cheese on top conjured images of a bad toupe and the bread itself was a bit sour or even panis. Not sure if it was just old but it shouldnâ€™t have been up for sale at any rate. The sourness could also indicate that the dough was allowed to rise for too long. Also, it looked like it was made by dropping a single blob of dough in a muffin or straightsided pan. Weight and proportions of the bread were not on. Somewhat pricey at PHP48 when compared to others just meters awayâ€¦ Final verdict: UNREMARKABLE and AVOID. I was surprised to see ensaimadas at BIZU, a favorite patisserie of mine where I snort macaroons by the half dozen. They shouldnâ€™t have strayed from French pastry and dessertsâ€¦ their ensaimada was perhaps best described as fusion bakingâ€¦ though topped with cheese, they were wettish widish strips of what looked like processed cheese food (though I canâ€™t tell for certain). There was also a thick layer of whipped or “extended” butter on top. Though it was denser and more breadlike than other ensaimadas tried, it was still apparently plopped in one blob into the pans (as opposed to the original twisting of dough). It wasnâ€™t as airy as the airheaded ensaimadas later in this post nor was it overly sweet. I would say it just didnâ€™t have oomph or character. It was slightly darker or tanned than most but it was all image and no content. They had a myriad of bizarre flavor combinations for sale as well. Sorry, I like my ensaimada pretty plain (no ube, chocolate, nuts?!?) please! Final verdict: EAT A MACAROON INSTEAD! Hizonâ€™s has a reputation that precedes it. It is near famous, in fact. So I was pleased when my wife brought home a Hizonâ€™s ensaimada from the basement of Landmark for me to try. I opened the distinctive cellophane wrapper with brown markings with heightened anticipation. But instead of finding ensaimada heaven, inside was a small, unremarkable, airy (though more bready too) version. The cheese on top was sparse and butter and sugar melting. At PHP60, they have got to be joking!!! No way, Jose. Or should I say, no way, Hizon-ay. Final verdict: EXPENSIVE and AVOID. Surprise find of the month was Le Coeur de France. While Bizu floundered on a Filipino classic, Le Coeur does a surprisingly good job. Hailed as a â€œClassic Ensaimadaâ€ it is indeed more tanned than others though still soft rather than crusty or flaky. It had a nice consistency and felt like it came from a proper bakery. It was oozing with butter on top, perhaps a bit too much actually but that could have been just the specimen I tried. Rating wise I would put this just shy of the Mary Grace and Cunanan ones. I think it does well in that I had no expectations of an ensaimada from a chain bakery but it tasted surprisingly good and at PHP45, not that expensive. Some matronas might even remove this from its packaging and pass it off as their own. Final Verdict: GOOD everyday conveniently available ensaimada. Mary Grace is a highly popular brand of ensaimada. Originally a bazaar participant, she parlayed public demand into a name brand and stalls in major malls, including Rockwell. I do not like this generation of ensaimadas that are puffy airy light with a lot of dry salty cheese on top. However, having said that, I can understand why others have grown accustomed to it when there is a dearth of alternatives out there. This is closest in texture and flavor to the Cunanan ensaimada (reviewed next). At about 90 grams on average it is cakey, soft, airy and quite yellow dough. The grated cheese is larger than Cunanan and overall it is a reliable quick snack, though of the â€œnew generationâ€ ensaimadas as opposed to a more traditional one. At PHP44 each, value is not bad. Final verdict: GOOD if you canâ€™t be bothered to make your own. Marketman has reservations though. Everyone I asked about the â€œbest ensaimadaâ€ seemed to point to this pinnacle of ensaimada-hood somewhere tucked away in Valle Verde, Cunanan ensaimadas. I made the trip myself to see where this epicenter of baking wasâ€¦ While there, I was in line with two other cars who were picking up their goodies that were in white cardboard boxes. Back home, I tore into the ensaimadas, wrapped in a unique almost seminary inspired paper pyramid that promised great things within. I was a bit disappointed it was again of the â€œnew generationâ€ ensaimadas that are best described as a light cake with cheese topping but I have to admit it did taste pretty good. About on par with Mary Grace save for the main difference which was the powder dry and better quality cheese that was on top. There was so much grated cheese that the mouthfeel was akin to salty polvoron, drying out every ounce of moisture on your tongue and inner cheeksâ€¦it was disconcerting, to say the least. Again, Marketman has reservations about this style of ensaimada but can see why many hail this as one of the better ones. At PHP37.50 each for the large ones, this is good value. No mall overhead and still the hint of it being home-made (albeit the apparent volume churned out) gives this an edge over Mary Grace. Final Verdict: GOOD if you canâ€™t be bothered to make your own. Pain in the neck to pick-up if you only want a few pieces. A mystery entry is this ensaimada that our nice landlord sent over as a Christmas present. Clearly home made, I am not sure if it was made in the family kitchen or ordered from friends. I review it here because it is still a bit of an enigma. It is nice and big (more old-style) had tremendous flavor and good texture and was oozing cheese butter and sugar on top. The base was also really oily which suggests it was either made with lard as is traditionally the case, or better yet, a 1960â€™s shortcut could mean near yellow orange star margarine instead. The flavor was good but a bit oily. I liked it more than most commercially available fluffy versions so it rates high, even if some of the ingredients are suspect. I have no idea how much this cost and I donâ€™t know who made it (too embarrassed to ask my landlord to divulge source) so you will just have to keep guessing unless you know who made it. Final Verdict: GOOD, Iâ€™ll eat this over most commercial ensaimadas any day. Finally, the large ensaimada available at the Salcedo market made by the family of Marc Medina, the market manager of sorts. Based on an old Pamapanga recipe that approximates the ensaimada the way I like it, it has the right color, lightness, just the right amount of sweetness and no cheese on top (but it may possibly be baked into the dough). Mr. Medina admits the recipe was altered a bit to meet more modern tastes (and propensity for airier versions) but this is the best commercially available ensaimada I have had in a while. Not perfect, just very good (it’s also the first ensaimada photograph at the top of the post). Also, once or twice I have gotten it slightly sour which means they let it rise too long. It doesnâ€™t last long eitherâ€¦but that is more of a good sign, really. At PHP160 or so it is pricey but I think well worth it. Final Verdict: VERY GOOD, I can eat this fairly often. Next up, after criticizing everyone elseâ€™s ensaimada, I will post a recipe of my familyâ€™s that isnâ€™t perfect either but is what I like in an ensaimadaâ€¦stay tuned! hi,have you tried diamond hotel’s ensaimada? im not a fan of the modern ensaimadas either so i was in heaven when i discovered their ensaimada. you better go early though if you want to try because they usually run out by 5.
and thanks for the tip on marc medina’s ensaimadas. i will look for them the next time i go to the market. Read your post early this morning before heading to Salcedo market. Unfortunately for me, Mr. Medina was not at the market today-or at least not from 7:30-8:30am. I guess I will have to wait until next year to try his ensaimada.. and was so looking forward to having one! Merry Christmas! i kinda like these taste comparisons thing that you do. saves a lot of time and calories trying to find out the best. keep em coming! I’m waiting for the other posters’ suggestions to see if we can’t discover the greatest ensaimada in town. Incidentally, have you had the original ensaimada from Mallorca in Spain (they are ferried over daily to Barcelona, so any pinoy who has been to barcelona will probably have checked out the ancestral ensaimada!) Totally different from our version. first, no cheese, just an icing sugar topping, and much larger, not meant to be an individual portion. Another colonial delicacy that has been transformed and adapted to our particular tastes. Wonder who thought of the cheese topping. 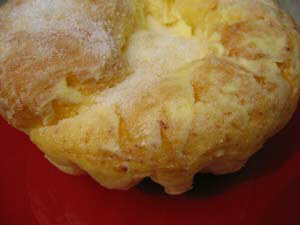 Have you tried the ensaimada from Pasteleria Mallorca? My mother likes them because she says they’re more traditional (I prefer the modern varieties). They’re located in Scout Fuentebella St. in QC (near Estrelle’s caramel cakes which is also a favorite), we usually call them to order in advance. They also make really good sans rival. Happy holiday eating! You can also try Malolos ensaimada, MM. They are more traditional also and they don’t have cheese on top. You can find it at Sidcor Market (every Sunday at Lung Center of the Philippines parking lot). Upps, Sidcor Market is close on Christmas and New Year’s day but open on Nov. 24 and Dec. 31 from 5:30am to 12nn. release yr own recipe sometime maybe I can make some for the New Year. most Filipino friends cant understand why I wont touch the wonderful cakes. Am off to the farmers market now and its almost eve Phil time. i actually like mary grace ensaimadas. it’s good that you didn’t bother with mega/supermelt ones… but the best i tasted was the ensaimadas we’d receive from a family friend. it was home made and absolutely delicious. the cheese was not too much or OTT, the bread was a bit dense and the serving was small, not the humongous ones we’d see nowadays. unfortunately, times are hard, and giving away ensaimadas to all your friends can get quite expensive. also our tita said she was getting lazy from baking them. hahaha. PS I have tasted the ensaimada in Mallorca not ferried from Barcelona but baked in Palma. I was at the Salcedo Market a couple of weeks ago, and when I saw that large ensaimada, I immediately thought of you, MM! From the looks of it, I knew it was the type you would like. There was a woman beside me who saw me looking at it, and she said she bought it every week. I bought one and most of my family liked it, but we still like Mary Grace’s best. My dad, however, shares your preference for the old-style ensaimada. His favorite is the Yulo ensaimada that they used to sell in Canlubang Golf Club. No idea if that still exists, though. have you tried the ensaymada from the NE bakery.. but its located in Cabanatuan City. It taste like the one from Malolos. LOL, gee I could not help laughing out loud really the way you described the ensaimadas. Really funny, you should write for a living. My officemates was wondering why I was laughing, they thought I am crazy (not that I’m not, hehehe, but Prozac helps :). I gotta agree with Cecile. The Diamond Hotel ensaimada is something else — wicked, dense, head-swirlingly creamy. I,m really drooling over the talk about ensaimada. After reading your articles I went round all over Edmonton, Canada looking for filipino shops that sell ensaimada. Can you imagine my disappointment when I didn’t get any. Well, I supposed I just have to wait for your recipe and make it myself. If you like just butter and sugar on your ensaimada, try the ones of Carla Lim (of the late Danel and Laszlo). She still takes orders for them. Her mini cinnamon rolls are yummy too. I’ve tasted the Yulo ensaimadas as well and they are similar to Carla’s. One could order them before – let me see if still possible. please try enseimada malolos in bulacan and rate it yourself. i’ve heard it is the most famous in luzon and it is the best. I think a real good ensaimada has to stick close to the taste and texture of real good brioche. It’s really brioche Filipino style if you ask me. Of course we added cheese on top. I’ve tried some of the stuff above. Hizon’s is good. You really have to go to Malate to try the fresh baked ones. WHat you got is probably old. I agree it should not be cake like in consistency. If I’m in the mood for ensaimadas and can’t find any available I just buy some croissants, slightly warm it up in the oven and spread butter and sugar on the top. Yummy! Hey linda thanks for the tips, I will really try your suggestion. Its better than nothing. Maybe the sweet buttery flavour that i miss. I guess i can use any soft breads. why not write an review of the ensaymada of goldilocks , mulach melt. i miss the old style ensaymada that small time bakery sells. i ‘ve tried buying ensaymada from bakery but it doesn’t match the kind of ensaymada i used to eat when i was still small. keep up the good work. My husband is an American and very picky. He doesn’t like any Filipino bread at all but ensaimada. We stayed at Manila Pavilion for 3 days 2 yrs. ago when they were building the space for Starbucks. Then finally they were open and I was surprised that they sell ensaimada! I bought a box and had my husband try it. To my surprise he loves it! He tried few ensaimada like the Muchlac’s but starbucks is still the best he said. He wish that Starbucks here in US should have ensaimada.lol! I wish too! Will be visiting Manila next month. Where is Salcedo market and what is the name of the store? I would love to taste this Medina ensaymada or is it ensaimadas. Which is the right spelling? Karen, where is Swan sold? Juana, there are lots of other ensaimadas available around Manila, I am certain your husband will find several to his liking. cfusion, the Salcedo market is held every Saturday in the Salcedo Village Parking lot, near the Makati Sports Club. It is hard to miss. The ensaimade of Mr. Medina is available in a stall about 20 meters from the barbecue grills. I think it has Arayat written on the banner behind it. You can’t miss it if you have two eyes… but the ensaimada goes fast so go early. ENSAIMADA is the spanish spelling of the predecessor pastry or bread. Ensaymada is the localized spelling, I would guess. I am an American woman married to a wonderful Filipino man frm Quezon city. Many many years ago I had the great opprtunity to stay with a Filipno family in Milpitas,CA, and the Lola of the family made Ensymada each evening for her grown children to sell at work to other employees. In no time at all she had me making the pastries with her! We made the regular variety and one with ham and cheese. After all of the years(at least 24!) I have never had an Ensymada as god as hers. I only wish I had her recipe. I do remember to this day the process, as we made it out on the table starting with a pile of flour and you added the ingredients right there. No bowls, just the table. I would love to get my hands on a good recipe as the bakeries here in Seattle,WA or Vancouver,BC that I have ever been to just dont hold a candle to the hand made pastries by a Wonderful Lola with love! Jamie, I should have an ensaimada recipe posted within one month’s time. I have been working on my sister’s recipe which goes back to the 1950’s and a small family bakery where we had wood fired ovens… stay tuned. Hi, Marketman! I’ve been enjoying your blog from across the pond in the Bay Area. While California has fabulous food, the Philippines has many culinary delights we take too much for granted. I, for one, am always agog at what Manila has to offer. Thank you for shining a light on our local delicacies and finally doing justice to one of the most underrated food cities in the world. As for ensaymada, I think I’ve had most of the above fairly recently. I like the old-fashioned ensaymada myself, and I feel exactly as you do about the Cunanan ones, which typify the “modern” type that many of my friends favor. Hizon’s has been an old favorite, though they can be disappointing when stale, and they don’t sell the ones with real queso de bola in Landmark. My two new favorites are the Salcedo Market ones you mentioned and the Pastelleria Mallorca ensaymadas. Having just dined on both within days of each other (I carefully carried them across the Pacific and warmed them very gently in the microwave), I’d have to give the Blue Ribbon to the Pastelleria Mallorca ensaymada. Similar size, heft and body as the Salcedo one, but not as oily at the bottom, and with better-structured dough. Topped with a generous quantity of queso de bola, butter, and sugar. I like the cheese being rolled into the dough of the Salcedo ensaymada, but it was a bit too salty for my taste. If you haven’t yet, I think you should give the Pastelleria Mallorca a call and order a few ensaymada. You won’t regret it. have you tried seattle’s best ensaymadas? it’s pretty good especially when served hot. yummy! I’ve tried jammies and i also think it is good (not pricey too). I bake ensaymadas myself the traditional way (very time-consuming with all the rolling and coiling)and when I’m too busy to make for my family, I buy. Commercial ensaymadas though are prepared with dough conditioners and improvers I suppose. Nothing beats home-made ensaymadas – I get it fresh from the oven, it has no preservatives and definitely it is cheaper!! Balloon, where is Jammies located? Do you have their phone no. too? Sorry Gonzo but it is spelled: Coeur not Couer…FYI..
Pilar, Jammies is in Vmall greenhills or in the market market mall in The fort. I usually buy mine at makati supermart in alabang. Tel? 8056001. Well thats what it says in the wrapper. Just bought a box again…yummy! My Mom’s dying to get a taste of Mary Grace’s ensaimada. can you please email me their locations? Where here in QC area. and also do you happen to know her son’s coffee shop located n fort bonifacio? Have tried most if not all of the ensaymadas mentioned above even the Malolos ensaymada. 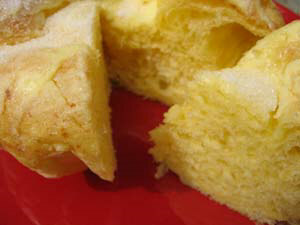 The Malolos ensaymada is quite different since it has sliced salted egg as a topping. It is not as cheesy as the other ensaymadas and is too sweet for my taste. For me the best ensaymadas come from The Diamond Hotel which is now P100.00 a piece. It is a must for every bread lover. It is soft, cheesy and buttery. It melts in the mouth. YUMMY!!! The ensaymada with quezo de bola that is sold in red ribbon outlets in California is also good. Has anyone tried here Richmonde Hotel’s ensaimada, don’t know if that’s good, but for Php 60, and it is quite big, if ittastes good pa, then it’s definitely a steal..
Janssen, I live in Manila. My mom used to bring home Manila Pen’s ensaimadas with ham inside! I like it even if it’s on the dry side. She also gets pretty good ensaimadas from this house in San Francisco del Monte St.? I’m a filipina living in germany. we have a family bakeshop. my husband is a german master baker. we sometimes bake pan de sal and ensaimada for filipino consumers (they aren’t very many here) but ocassionally we get big orders from some small entrepreneurs when they have parties and gatherings. In the near future, we will be sending some samples to Dublin at a filipino community shop there. Our ensaimadas and pan de sal taste good and although soft, it isn’t really full of air when pressed like the pan de sals or ensaimadas we have back home. we haven’t tried small ensaimadas because ours is about 16-18 cm. in diameter. we can send orders to different parts of europe. we shall try to improve our ensaimadas, thanks for the tip. Somebody gave me ensaymadas which was bought at 18 Scout Fuentebella, Q.C. So far this is the best that I have ever tasted. They also sell Spanish Pastries and Mexican Food Products. Pilinut, san po kayo? Sa US po ba? Gonzo, please check out the spelling in the package. Marketman, will you allow me to use one of your ensaimada photos in my blog? It could be one of the photos that you didn’t use, too. 22loy, you are welcome to link to this article, and if you use a photo, indicate source… thanks. AMICI came out with a premium line of ensaimada. i have to admit i really loved it. it’s more of a classic take on the ensaimada. not sure what kind of cheese is on top. the only downside is that the cheese easily falls off once you open the wrapper, so just be on guard for that. bread-like, no frills. I do admit to being a fan of GOLDILOCKS’ ham ensaimada, too. It’s a meal onto itself. I know it’s commercial but for the price and convenience, I prefer it to other commercial places. I haven’t tried the Diamond Hotel ensaimadas. I saw them at last year’s bakery fair but they seemed too pricey. My mom and aunt are addicted to BIZU’s. Its all about the Diamond hotel! To those who like the traditional Filipino ensaymada, you may want to order the Edelweiss Torta from Tagbilaran, Bohol. You can do this through friends or family who are based there, or make a side trip (truly worth it) if and when you are in Tagbilaran (it is a small city so Edelweiss is close to everything). I remember my great-grandmother, who was from Tagbilaran, making torta the old-fashioned way – meaning she made the dough from scratch and kneaded everything in an old wooden bilao – even when she was already in her late 80s. The Tagbilaran torta is more bready, light, crusty, and topped with quezo de bola. And yes, made with pork fat. My lola rendered the fat herself and made chicharon out of the taba that was left after the rendering. She ate a rich diet but lived to a ripe old age of 94. PS – I’m amazed at how this post was written in 2005 and you still have a handful of comments well into ’08 and ’09!